Hello! I’m super excited and honored to be a guest blogger for Teacher Created Resources! My name is Staci and I am the author of a blog called “Let’s Teach Something”. I teach Kindergarten and I do lots of centers in my classroom. I do reading centers in the morning that focus mostly on our sight words and spelling words for the week. I have literacy centers that focus on certain literature (both fiction and non-fiction) and phonics skills. I also do learning centers in the afternoon. These centers are a hodge-podge of skills that still need to be taught and/or reinforced in any subject area. These learning centers include math, computers, puzzles, writing, sensory, art, listening, and surprise. Surprise center is one of my favorites because I can make it anything to meet the curriculum needs. Cereal boxes. Cereal boxes?!?! You got it! I put the materials for all 8 centers into a cereal box- then when it’s time for a certain theme, I grab the designated cereal box and it’s all right there! I have an index card listing all the centers- and the skill/activity the students will be doing at that center. Listening: Listen to a book on tape/CD. Be sure to leave the CD and books in the cereal box. Writing: Students always get a writing prompt. At the beginning of the year, it’s simply copying the sentence I have written. As they become more independent, I omit words for them to fill in such as “A tree is ______ and ______.” Towards the end of the year, all they get is an open ended writing prompt that allows them to be as creative as they want in their writing such as “In the spring, I like to ________________.” The writing prompt/example is the only thing that goes into the cereal box. Art: Students do an arts/crafts project related to the theme. Here they are making a mouse puppet. Be sure to include all patterns, master copies, and a finished sample so the kids know what their end goal is to look like. I do not include supplies, those are stored permanently at the art center itself, plus the cereal box isn’t big enough to hold all everything. Puzzles: Students put together a puzzle or do a higher level thinking activity. I do not include the puzzle in the cereal box. I only list what puzzle it is, and I grab it from my puzzle bin when it comes time for that theme. 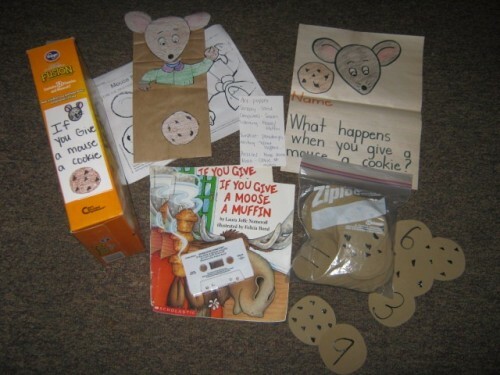 Math: If it’s an activity meant specifically for the center, it’s kept in the cereal box (like this math activity where they match the number on the cookie to the chocolate chips on another cookie). If it’s a math activity I use a lot, it’s kept with my other math curriculum materials. Sensory: This center is the easiest to plan and probably the students’ favorite. I have a supply of sensory materials that I rotate through this center: sand, water, rice, tire shreds, plastic Easter eggs, jingle bells, Legos, water beads, etc. I also have two dust pans to encourage responsibility and it allows the students to help in the clean-up! Computers: I have two classroom computers as well as three iPads. The students are given a computer program or an iPad app to do during their time at this center. Surprise: This center is very flexible in that you can put anything you need your students to work on. Sometimes it’s a holiday craft, other times it’s a skill that wasn’t mastered or just needs a little extra practice. I used to get this question a lot from my students. Now, I have jobs that they can do when their center task is complete. Writing: Students can draw/write with stencils. Art: Students can color in a coloring book. Listening: Students can use magnet letters to spell words found in the book. The rest of the centers are un-ending, meaning- they can rebuild the puzzle, keep playing in the sensory tub, or keep playing the computer game/app until center time is over. Centers are very beneficial for students because they teach the students the skill presented at that center as well as teaching the students how to work together. If they come across a question or are unsure of something, they are first to ask their center partner before asking me. It also gives me an opportunity to catch up on any work a student might be missing, do assessments with students, or reteach a concept that was not mastered in a small group. So, there you have it- my management and organizational tips for the centers in my classroom. If you have any questions, please feel free to leave a comment. And don’t forget to visit my blog for other tips, tricks, and tidbits I use in my classroom. Don’t forget to look for all the freebies I post! See you soon and thanks to Teacher Created Resources for having me! Staci Schutte, is a Kindergarten teacher and the author of a popular blog called Let’s Teach Something, where she shares tips, tricks, and tidbits that she uses in the classroom. She currently lives in Indiana with her husband, two sons and daughter and enjoys running, scrapbooking, and most recently shopping for pink things after having a baby girl a week ago. 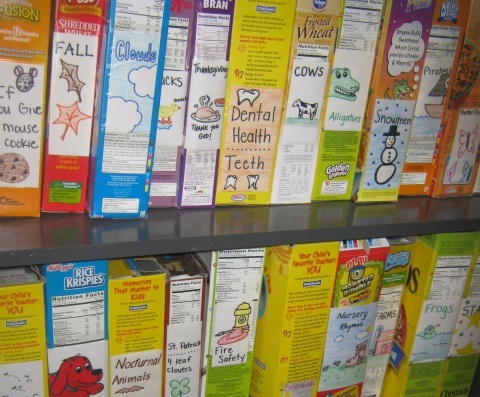 I love the cereal box idea. 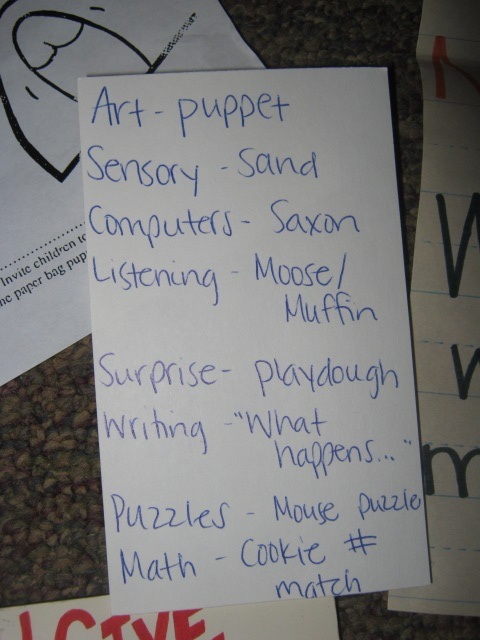 I have been trying to brainstorm ways to store theme related center activities in a way that is easy to find them. This might be just what I was looking for! Thanks for the suggestion! Better get started shaving boxes! I like the book “Let’s Teach Something”. I love to read it. Thanks, it’s really well organized.